Nip-sensitive cats will go crazy for Trish & Aidan Iriye-Robson's handmade, catnip-stuffed toy croissant. Crazy for croissants? Oui, but we bet you've never flipped over, rolled around, rubbed against, and drooled over one of them. (Not that there's anything wrong with that.) 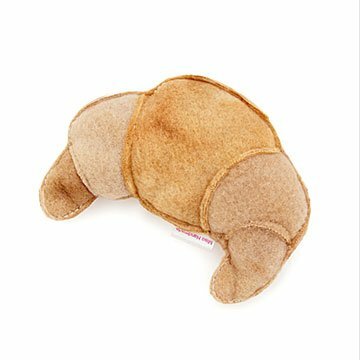 Featuring a handsewn, golden-brown fleece croissant shell stuffed with over ¼ cup of organic catnip, Trish and Aidan Iriye-Robson's fresh-from-the-oven pastry toy isn't really flaky; but kitty will be, under its influence. Handmade in Vallejo, California. Trish and Aidan live in the San Francisco Bay Area town of Vallejo, California, where they make toys and accessories for pets and their people. All her life, Trish has loved making things. Her favorite thing to do when she was small was draw and color, and she has a degree in painting. Despite coming from a long line of sewers—her mom is an amazing modern quilter!—it wasn’t until she was in her 30s and began sewing toys for her dogs that she discovered her own passion for the craft. Trish now makes toys with her husband, Aidan, affectionately known as “head donut stuffer.” Together, they aim to create fun, unique toys with a sense of humor and local consciousness. They love that each of their handmade toys is different from its litter mates and that each is beautiful, one-of-a-kind, and best of all—clearly not mass produced. Trish and Aidan are both so proud to be part of the handmade movement, and they hope you are, too! The cat loves this toy. Plays with it daily and has been for weeks now. I put it away and before I know it, it ends up back in the middle of the floor. I bought this as a Christmas present for my cat, and I hid it under my bed so that he wouldn't be able to find it... or so I thought. He must have smelled the catnip through the plastic wrapping, because he tore it apart and ripped the toy out of the bag. He LOVES this and goes absolutely crazy when he plays with it; I definitely recommend this if your cat likes catnip! best toy for cats that don't love toys! one year almost still loves it plays with it licks it carries it like he's a puppy...and this is a cat who couldn't care less about any other catnip toy. also nice size doesn't get lost under tables and soft so if i step on it it's not a big deal! may have to get another as a back up! I don't know what is in this catnip, but it makes my kitten go crazy!! It's hilarious to watch him. He'll dang near fight you if you try to take it from him! Super funny & well worth the price. Also, the design is adorable. Thank you. Of course, whether or not your cat goes for catnip determines whether they will ignore it. But daughter's cat, a catnip fan, enjoyed this particular catnip more than any other he has had. I think he enjoys the shape, too. Perhaps the best thing about this is he hasn't managed to tear it up! Somehow, despite hours of clawful interaction with the croissant, it remains completely intact. That's pretty good for a catnip toy.